DISCLAIMER — this article does not perpetuate MYTHS or GENERALISMS about the millennial demographic! We aim to provide ACTIONABLE and UNBIASED advice for marketers on the best way to communicate to the latest and largest addition to the workplace AND how best to engage an audience in the changing corporate landscape. Everyone hates cold calls. Even cold callers hate cold calls. This is nothing new. What you need to factor into your sales process now is that millennials don’t just hate cold calls — they hate phone calls. Phone calls of any kind. Last year the total number of millennials in the workplace reached 40 million. The year before, a Google survey found the number of millennial B2B researchers had dramatically increased. In fact, in 2014 18 to 34-year-olds accounted for almost half of all researchers. By 2025, 3 out of every 4 workers around the globe will be millennials. Times are changing and if you want to close deals with the next generation of workers then your sales methods have got to keep up. If millennials already hate and fear phone calls, how receptive are they going to be to what your sales guys have to say? This article summarises the reasons for millennial telephonophobia and how you can adapt your sales techniques to include added value and cause marketing, improving your close rates with the millennial demographic. If you are trying to choose an outbound strategy for your business download our free e-book — ‘Outbound Strategy: Why Emails Deliver 11x More Meetings Than Calls’. So why exactly do millennials hate calling so much? More than 75% of UK adults own a smartphone today, but a quarter never uses it to call anyone. Daisy Buchanan in a Guardian article last year attributes this aversion to how millennial manners have developed. Once calling was considered a necessity for everyday working life. Now, to younger generations, calling someone without warning is rude. Growing up with platforms like MSN Messenger, SMS, BBM and MySpace, and communicating via Facebook Messenger, WhatsApp, Twitter and even Tinder today, has normalised writing for millennials as the primary means of communication. Writing is asynchronous, meaning it allows you to take the time to compose your thoughts and plan out what you want to express. A live conversation, on the other hand, will always involve some level of improvisation and spontaneity — and millennials don’t like that. For what has been labelled the “anxiety generation”, making or receiving a call can be a nerve-wracking experience because it takes away that time to reflect and prepare. Twitter allows its users 280 characters — a recent change from the previous 140 limit. Regardless, you read and digest a tweet in seconds. Millennials have become used to digesting information that has been filtered into soundbites, so phone calls feel long and rambling by comparison. A recent comScore study shows that millennials don’t engage with longer pieces of selling content. Ads targeting millennials need to be just 5 to 6 seconds in length to be effective. Sales techniques are going to have to evolve to be shorter and sharper if they want to engage with the Millennial worker. Emailing or messaging a friend or colleague is respectful because it doesn’t interfere with their schedule and demand their undivided attention for a period of time. One worker in their 20s told the Wall Street Journal: “Calling someone without emailing first can make it seem as though you’re prioritising your needs over theirs.” By calling someone you are imposing on their time. Millennials aren’t alone in their anxieties. Dr Guy Fielding, a psychologist and communications specialist at Queen Margaret College in Edinburgh, has been conducting studies into a developing condition known as ‘telephone apprehension’. 2.5 million people in Britain, that is 10 to 15% of the adult population, suffer feelings of anxiety or fear when on the phone. 2.5 per cent are so anxious that they are classed as truly ‘telephonophobic’. Factor these anxieties in with the already unpleasant experience of receiving a cold call: perhaps it is time to hang up your phones and try something new? If Cold Calling Doesn’t Work How Should You Sell To Millennials? Given the changes in how younger generations prefer to communicate, advertising and marketing are going to have to evolve with the times as more and more millennials enter the workforce. Think about the basic principles behind prospect mapping — even the most amazing, well-crafted, aesthetic piece of advertising is worthless if nobody can see it. You need to take your message to where your target audience is and reach out to them there. Nielson found that 98% of millennials aged 18–24 own a smartphone, more than any other generation. Millennials aged 25–34 are a close second with a 97% ownership rate, followed by Gen Xers aged 35–44 at 96%. Smartphones are practically ubiquitous in these generational segments so if you are in marketing or sales, you need to be capitalising on this key resource. Based on The Center for General Kinetics top mediums we have collected a few options and examples for you. Texting (including free chat platforms like Messenger or Whatsapp) is fast. You send and receive a response instantaneously. 68% of millennials admit to texting “a lot” on a daily basis, again much higher than other generational segments (just 47% of their Generation X counterparts admit to this). 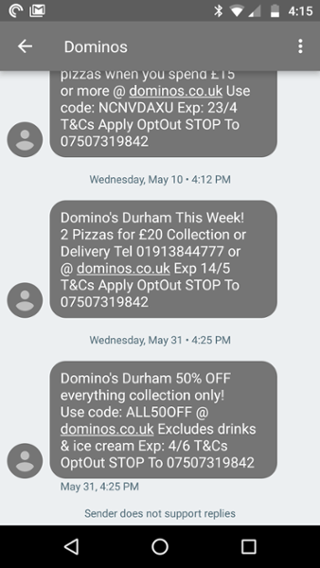 Companies like Domino’s or EasyJet use text to share offers that require an active response, like rewards or limited time offers, because of the immediacy of text message. However, this format is trickier for B2B sellers who need space to describe what service they are selling, and whose offers don’t carry the same sense of urgency. A study done by the Elite Daily found that roughly half the millennial population use social media or other internet-based tools to make buying decisions. A referral on a social media platform from a friend or family member has a huge influence on millennial decision making. But how do you get someone to use your service so they can positively review it? Building up an online presence may work for big B2C brands like Nike or Converse maintaining customer loyalty, but if you are a B2B business or a newer business, it is difficult for an unknown name to stand out from the noise. Social media needs to work in combination with your selling strategy — whether that is your LinkedIn profile or prospecting or sponsored banner ads leading to website content. A study by Movable Ink found that 48% of emails are opened on a smartphone. Despite being older than other platforms millennials have not abandoned email. Email doesn’t require an immediate response in the way that chat platforms do and allows for a longer, more crafted message — perfect for workplace communication. A survey of US marketers conducted by the Direct Marketing Association (DMA) and Demand Metric in June 2016 found that email had a median ROI of 122%, four times higher than other marketing formats, including social media, direct mail and paid search. Of course, this metric is very different for B2B email campaigns, but 59% of B2B marketers still find email to be their most effective channel for generating revenue. Now I referenced a recent comScore study showing that millennials with much shorter bites of content or advertisement — but this doesn’t mean they have a shorter attention span. The concept of millennials being crippled by their early introduction to technology and digital platforms, and finding it impossible to focus for extended periods of time, is a commonly cited misconception originating from the infamous Microsoft goldfish study — a study drawing questionable conclusions. While millennials may become distracted easily, this is not reflective of any physiological or psychological change to their mindset. The internet and the increasing usage of second screens contribute to a much more competitive landscape for a content marketer or direct advertiser. Millennials have developed a higher standard for entertainment due to their content-heavy, environment. It is the most competitive time to get your voice out there because everyone is doing the same, everywhere, all of the time. Millennials place a higher value on quality experiences, so in order to hold their attention content must provide some form of experience. This can be educational, entertainment or socially orientated. Selling what your services are or what your product does is not what millennials are interested in; only 1 percent say that they are influenced in anyway by advertising. They engage instead with brand values, authentic and honest content, seamless and engaging brand interactions, and ethical outlooks. As Simon Sinek puts it, ‘why’ you do it is more important than ‘what’ you do. A CrowdTwist study found that almost 50 percent of respondents are loyal to brands with socially conscious benefits such as charitable giving or rewards for brand interactions. This is often referred to as cause marketing. eBay presents a perfect test environment for cause marketing. Whenever an eBay seller lists an item for sale, they are given the opportunity to donate a percentage to their charity of choice. The seller’s resulting listing has a unique identifier that helps that item stand out on the site. A study eBay conducted around use of this feature found that when buyers were given the opportunity to donate they were far more likely to actually check out (key when basket abandonment rates for leading e-commerce sites are as high as 76.6%), and that they were more likely to go with a seller affiliated with a charity than one who wasn’t. Sellers incorporating the option to donate saw a 29% increase in their sales. Larger corporations invest in charitable giving and social campaigning on a much larger scale. Unilever for example practices cause-related advertising across all its brands, with values of development and sustainability being core to its company values. The Unilever Sustainable Living Plan aims to help 25 million people gain improved access to a toilet by 2020 — with brands like Domestos partnering with UNICEF to work towards that end. It also has projects focusing on improving health and well being, reducing environmental impact, and sponsoring development. Cause marketing, and added value as opposed to a description of your product or service, is an important perspective not just for inbound techniques like content marketing but outbound pitches and email copy. According to Corporate Vision findings, 74% of B2B buyers choose the sales rep that was first to add value and insight. The era of hard selling is long past, now in order to close a deal you have to help your prospect with their problems — something profiling (blog link) will help with. 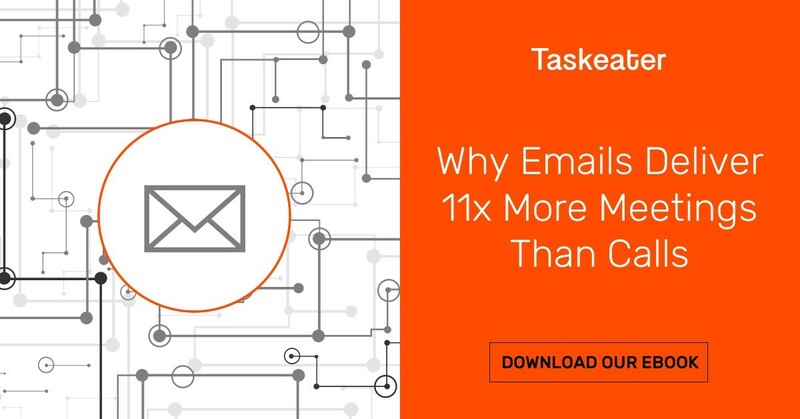 If you are still deciding on your outbound strategy, download our free e-book, ‘Outbound Strategy: Why Emails Deliver 11x More Meetings Than Calls’. We also provide expert advice and services in this area — why not get in contact and speak to an expert today? Managing Director of Taskeater and one of Taskeater’s former clients. He has 16 years of sales experience, two boys and loves rugby. Connect on LinkedIn. This story is published in The Startup, Medium’s largest entrepreneurship publication followed by 312,921+ people.